Coffee cakes are basically just an excuse to eat cake for breakfast, but I mean, that’s basically what muffins are too right? 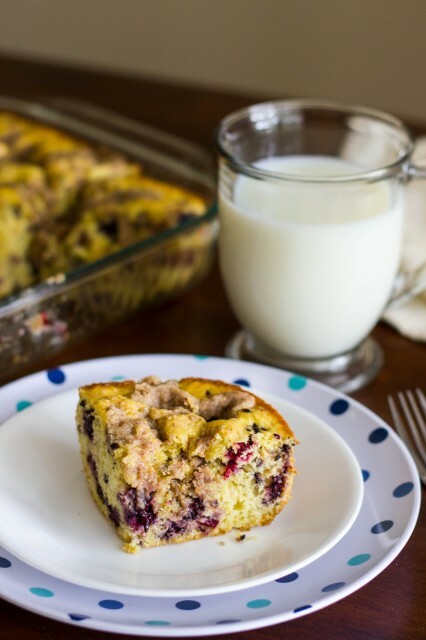 😉 This coffee cake uses a light, buttermilk batter, lots of blackberries, and a buttery, crumb topping (and for those of you that may be wondering, coffee cakes do not contain coffee!). I used fresh blackberries but you could use any berry you like – blueberries or raspberries would be delicious too! The only downside is that you have to wait almost an hour for it to bake. Small price to pay, right? You can use the bake time to wash up the dishes…or finish your book while relaxing on the deck, either one haha. This coffee cake would be perfect for brunch and leftovers can double as dessert…if there are any ;). Enjoy! 1. Preheat oven to 350 degrees. Spray 9×13 baking dish with nonstick spray. 2. In large bowl, beat eggs until frothy with whisk. Mix in sugar, oil, and milk. 3. Add flour and whisk just until combined – do not overmix. Gently fold in blackberries. Pour into prepared pan. 4. Mix topping ingredients together (should be coarse crumbs/lumps of topping) and sprinkle over batter. 5. Bake in preheated oven for 50-60 minutes, until cake is lightly brown and toothpick inserted near the center has only a few moist crumbs. .
6. Serve hot or cool in pan. Note: If you don’t have self-rising flour, you can use 3 cups all-purpose flour + 1-1/2 tbsp baking powder + 3/4 tsp salt.